I must admit to a certain degree of snobishness regarding straight shoes, considering them the poorer cousin of paired shoes. I had thought all the benfits were for the maker and in the process missed one of the advantages of the wearer. Sue was wearing her rather nice pair of Kevin Garlick seventeenth century latchet shoes at Linwood House last weekend and observed that she had been wearing her straights one way around and had noticed they were starting to wear on the heel, so she had started wearing them on the other foot to even out the wear. I think she’ll probably get 30% more wear out of her straights than I will out of my pairs, gaining much better economy over the life of the shoes. Maybe paired shoes were yet another form of conspicuous consumption by the Puritains along with the black clothing. When I was writing the Big Book, I had a lot of trouble finding information on snapsacks, particularly the long leather tube style. There was so little evidence that I’d seriously considered pulling the section entirely. On a recent visit to the National Gallery of Victoria I found the image I’d been looking for. Not quite in my own backyard, but an easy 10 hour drive south. Here’s the painting and below is the detail. 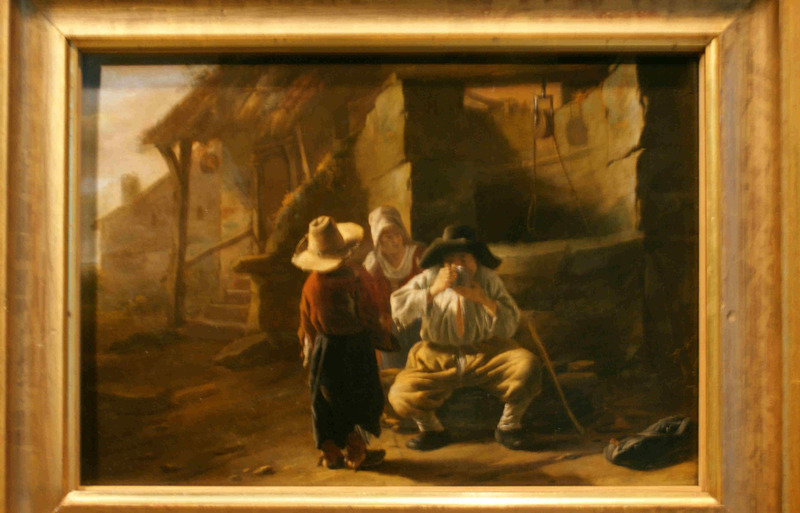 Andries Booth, 1635-41. Travelers by the well. 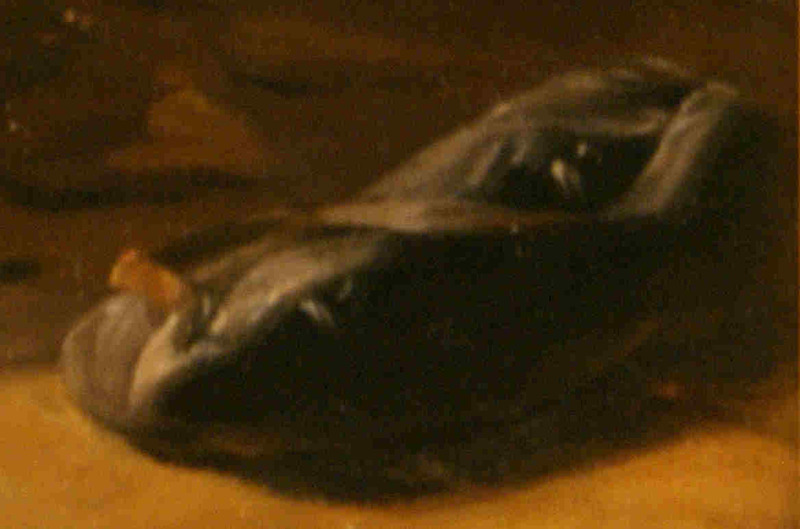 Detail from the bottom right corner. More from the NGV later. A flacket is a type of leather flask or bottle made from only two pieces of leather, one for the front and one for the back. It has no base, but may additionally have a welt or gasket piece between the front and back. Depending on your cultural prejudices, these are sometimes also known as pumpkinseed- or pear-flasks. Designed mainly for upright use such as hanging on saddles or being worn on the hip, in common with the three-piece upright bottle, this type of bottle is almost universally asymetrical. The outside face is always deeply curved, accounting for most of the volume, with the back being raised but flat so that it sits comfortably when worn and provides a flat surface for when it needs to be put down. Line drawings of some of the flackets from the Mary Rose. Click on the image for a full page version that might do it justice. No information about the manufacture of this type of bottle survives, so the usual divide between the rammed sand/grain/shot moulding and the wooden core moulding schools of thought exists, with an interesting twist that I’ll deal with in a moment after I’ve cast some nastursiums. No example I’ve seen produced by sand-moulding artisans has ever accounted for the asymetry required by this design, and very few manage the sharp angles and extreme stretching required to match the Mary Rose examples without resorting to ahistorically thin leather. The third school, to date only present in academic works, shows such naievity and lack of understanding of the mechanical characteristics of sewn leather that I’m including it here almost as an humourous aside. This method is blow moulding (cf Gardiner et al. p454). In this method, two flat pieces of leather the shape of the finished product are sewn together, wet, raised to the lips and blown into, in the manner of inflating a baloon. 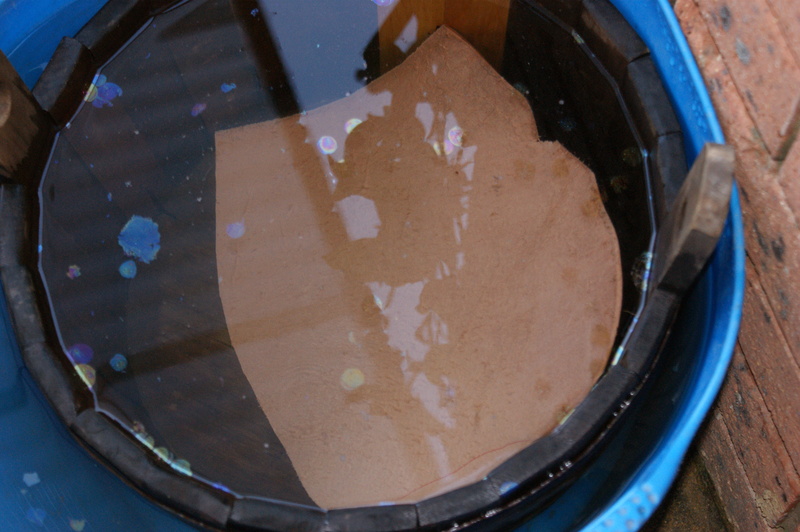 The wet leather then somehow holds it shape as it dries. I’m unsure when the embossing and stamping is supposed to be done with this method. 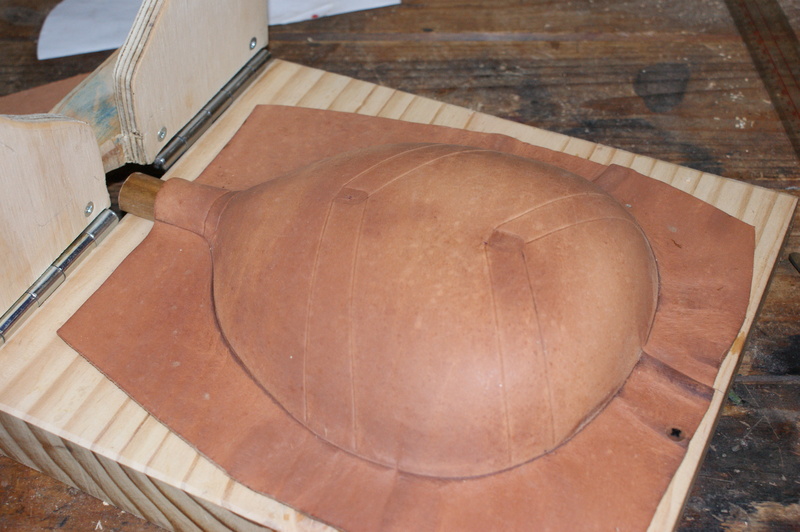 I have seen a variation of this theme used, where the sewn leather envelope was connected to a garden hose and high water pressure used to stretch the leather to shape. It was then dried and waxed. Note that none of the inflation-based methods allow for the requisite asymetry. I own a rather nice example made in about 1983 by an (at the time) young lad who’s dad was a member of the Leatherworkers Guild of New South Wales. It and a few other examples they sold were made by nailing wet leather to a board over an approximately shaped mound of newspaper, not unlike lasting a shoe. I suppose the point of the tirade thus far is that we don’t have any idea how these things were originally made, so as long as your method results in an end result that is near enough to the original to make you happy, stick with it. I’ll spend the rest of this post discussing how I tooled up to produce a copy of one of the Mary Rose flackets (81A2218) for a commission. I won’t go as far as stitching it all together and sealing it as I’ll be doing that as part of a seventeenth century display at the Blacktown Medieval Fair later in May. Drop by and say hello if you’re around. Stitching and sealing were covered in my earlier post on Costrels if you need a refresher. My technique is more or less derived from my approach to jack making although probably owes it’s heritage to the silk screening equipment I played on as a small boy in the late 1960s. There’s also a nod to the newspaper nailed under leather in this. All of the Mary Rose flackets are decorated to a greater or lesser extent with a combination of cuts, embossing and stamping. Baker observes that stamping requires a solid, stable base, so I’ve taken his advice and built a wooden core for moulding the front, and another for the back. All the embossing seems to run from the high points to the low, and may be a quick and decorative way of working the leather on to the core. I’m going to claim this in the lack of any real evidence and move on in the hope you won’t notice. A frame tensions and stretches the leather over the core. 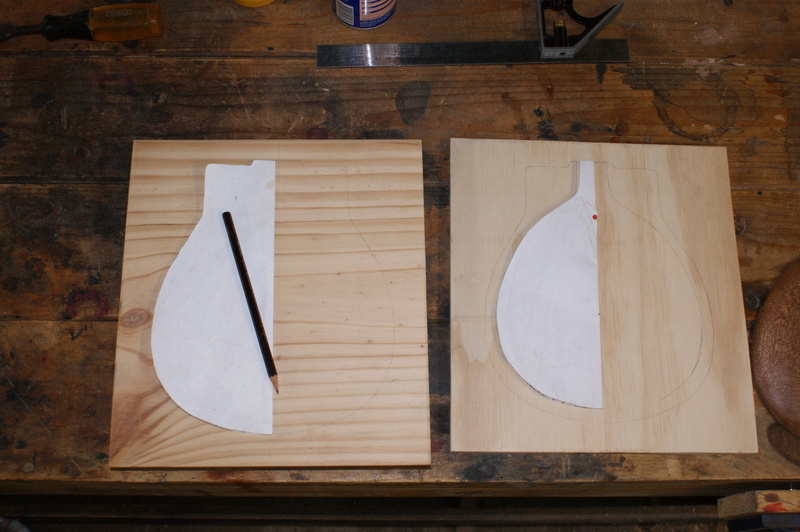 The first step is to make the wooden cores. In my time-honoured tradition of taking the lazy approach, I enlarged the drawings from the Mary Rose book to life size on a photocopier and then made another copy. The first one I folded about the axis of symmetry and cut out along the outside. This includes stitch allowance and the carying ears and will be the plan of the finished pieces. The other I cut the thickness of the leather (about 4mm) narrower than the inside line of stitching and used it as the shape for both the cores and the cut out in the stretching frame. 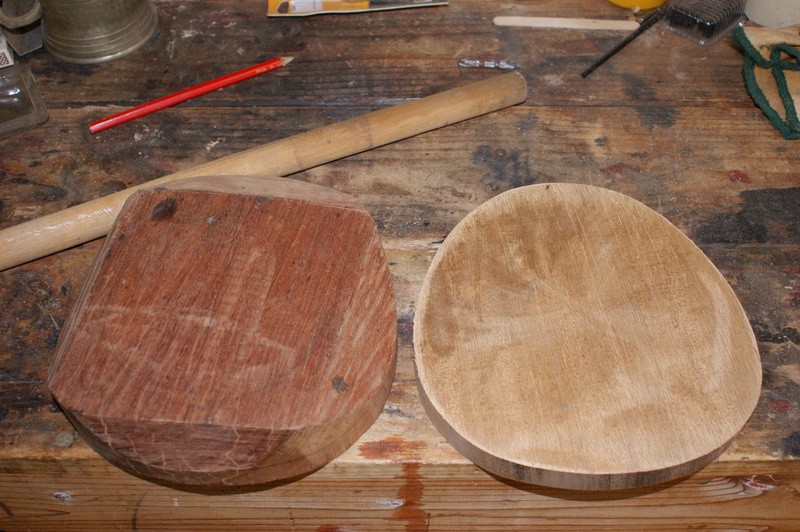 The two cores, roughly cut from scrap timber. The dowel was used for the neck. 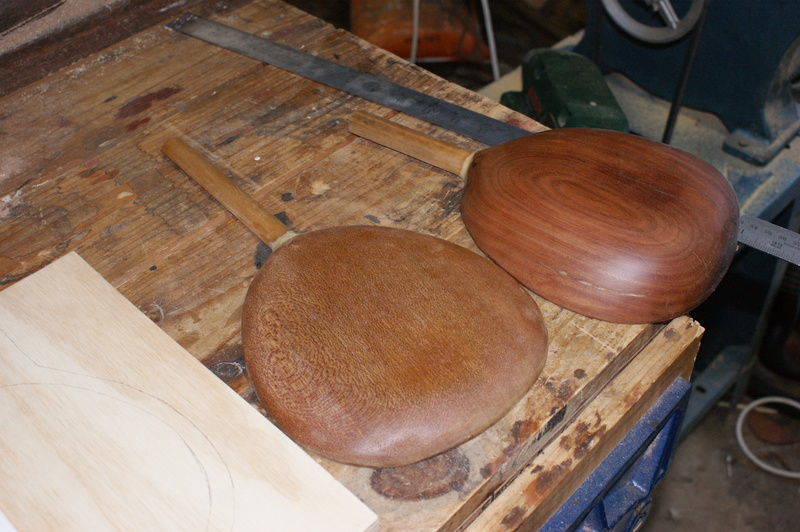 The core for the front was made from a substantial piece of spotted gum, a left-over from our back steps. Looking back, it would have been easier to do it from something soft like oak. Or mild steel. It took a lot of work with saws, files and sanding to get it to shape. The two finished cores. The neck dowel is held in place with a filling epoxy because I’m too lazy to carve it from the one piece. You can roughly gauge the volume of the finished bottle by holding the front and back core together in a bucket of water and measuring the volume of water displaced. Round down a bit to allow for the thickness of your chosen waterproofing solution. The required volume for this commission is the statuary 1 quart (2 pints or about 1.2l) so my halves may be just a smidge thicker than used on the original although we have no way of knowing if there’s been any shrinkage during 550 years in the Solent. The next step was to make the frame. The base is from a substatntial lump of radiata scrounged from a building site rubbish pile and the top is from ply for ease of shaping, with a 50x25mm radiata frame to strengthen and provide a surface for clamping. This is the base (feft) and the top (right) of the stretching frame. 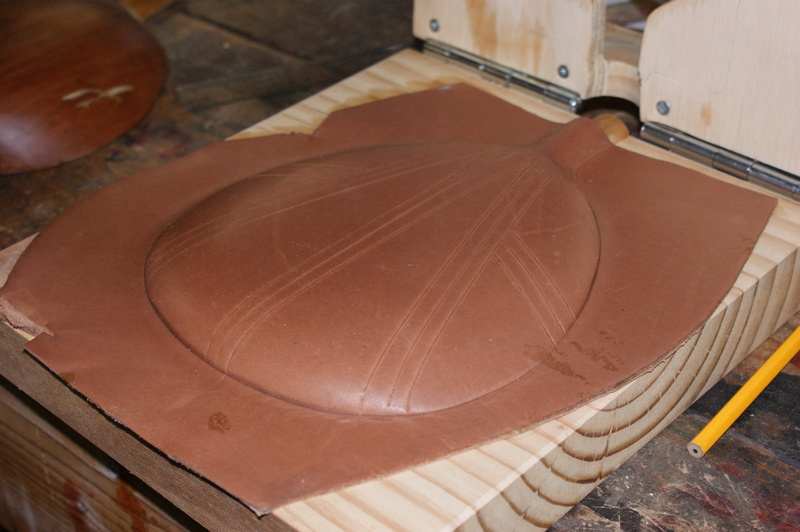 I’ve drawn the shapes on the top so I can cut it out and the base to assist in alignment of the core. After cutting out the hole in the top piece and cleaning up the edges where necessary with a file, the stretching frame was ready to assemble. To keep the tension on the frame even and avoid pincing the leather at the neck end of the bottle, I put two pieces of the leather I had planned to use as a spacer between the top and bottom before attaching the rather substantial hinges. 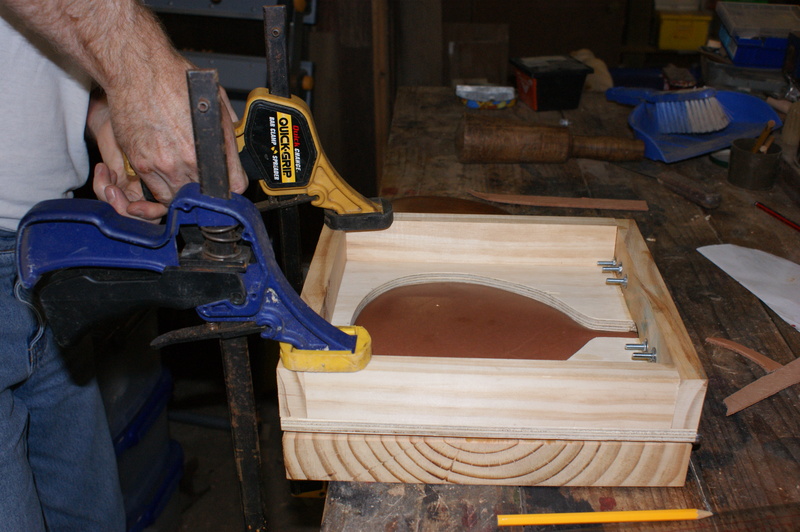 This is to ensure the top and bottom are parallel when the leather is being clamped. The finished frame with the back core in place for moulding. Soaking the leather. I know you know how to do this bit but I’m really showing off my first attempts at coopering – the two new staves in the tub. The frame was now ready for use. While soaking the leather (I’m using 3.5mm carving leather in this case), centre the back core on the frame base using the pencil lines as a guide. 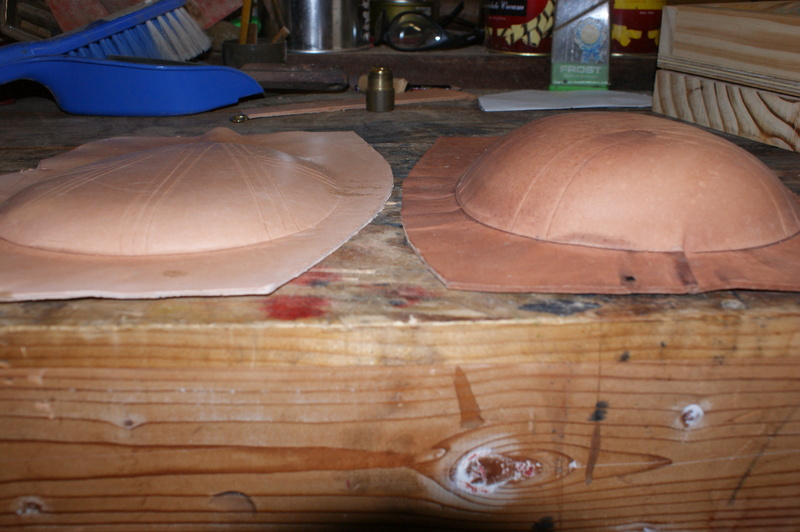 Lay the wet leather skin side up on the core and lower the top leaf of the frame. 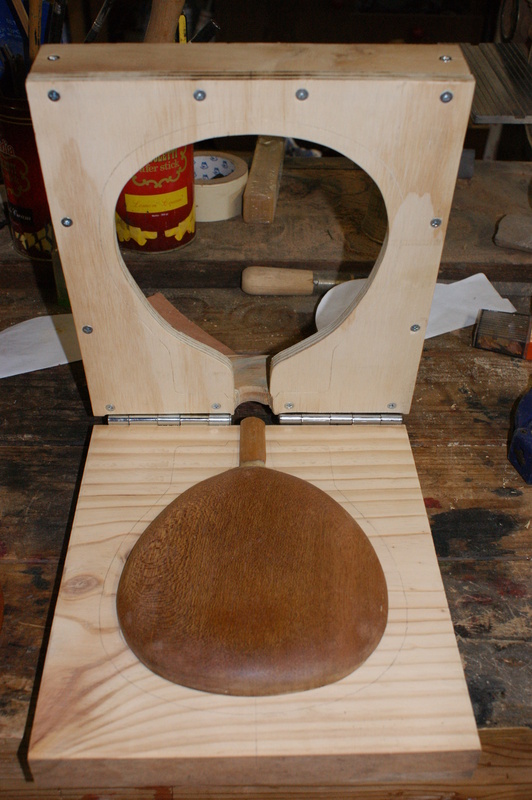 Clamp in place, smooth any puckering or bubbling with firm pressure and leave to dry. Clamping the back. 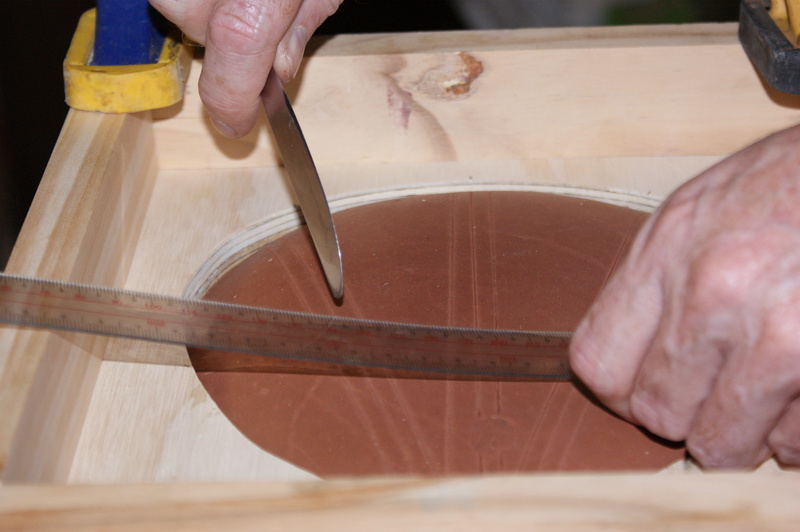 Make sure you work the leather around the wooden core and the core is approximately aligned before clamping. The area around the base of the neck seems to be a particular problem so I used an off-cut of leather to cushion the pressure and worked it down with both thumbs until it sat neatly around the core. This left a curved line not unlike the one shown in the dig report illustration. I found the points where the leather puckered on the back coincided almost exactly with the embossed decoration on the back of the target bottle, 81A2218, so I copied the embossing with the back of a butter knife after stamping my maker’s mark. This left the leather conforming tightly to the whole core. Embossing the back while still wet. The “W” inside the shiled is my mark, based on the Marian “M” on some of the other bottles. Yes, I am using the back of a butter-knife. We nipped off for a quick pike drill in the park and when we came back 40 minutes later, released the clamps and removed the leather. The moulded back-piece. Total elapsed time was about 50 minutes and could have been less if we hadn’t ducked out for half an hour. An unusual inside view of the finished back piece. 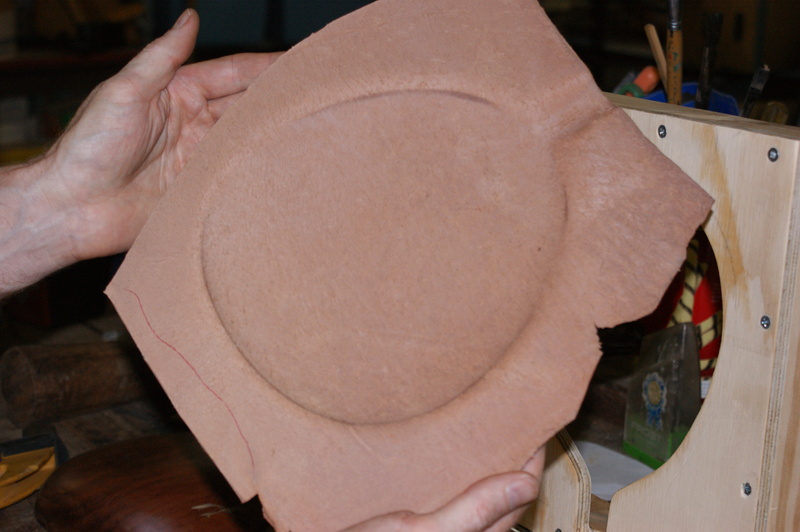 I then repeated the process for the front and found the puckering was different as the leather was stretched differently to the back, but again found that it corresponded to the embossed decoration on the original, particularly the double lines at the base of the neck were essential to getting that area to conform properly to the mould. The completed front. I was able to work all the creases out by dampening them and using thumb pressure. There’s a couple of changes that I’ll make next time I make a frame for flackets. 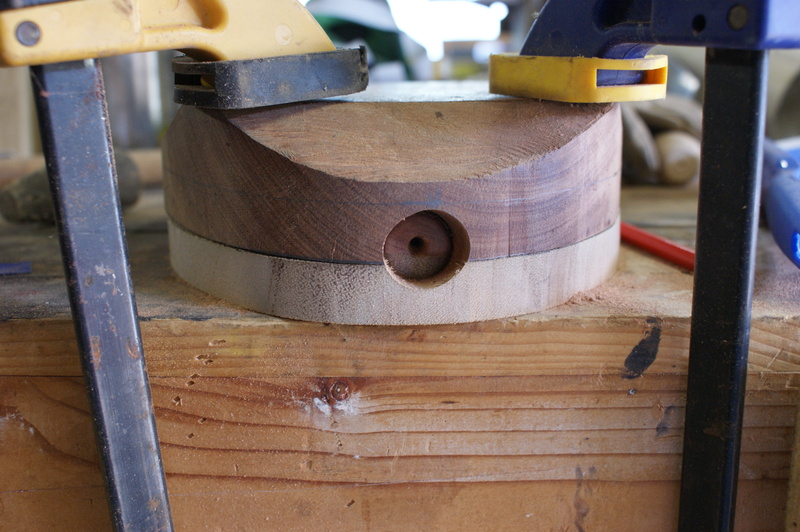 I had chased a line in the clamping surface of the top piece with a sharp chisel. this was supposed to leave a raised cutting line on the finished piece, but was too fine and didn’t show clearly enough to be useful. I’ll have to think about making it wider and deeper at some point. With the trouble I’m having shaping the base of the neck where it joins the body of the bottle, I think next time I’ll carve an arch in the top so the pressure is more even across that part than just clamping the sides of the neck turned out to be. This view is meant to show the different shapes and depths of the front and back. I had expected to have to drill a couple of holes in the base and use dowels to positively locate the cores on the base but found leaving them loose meant they self-centered far more precisely than I could have managed with a fixed location and didn’t end up leaving any marks on the leather from wriggling around while the clamping pressure was applied. The moulding was all done on a mild Autumn day, with this sort of frame I could mould at least ten halves in a normal working day in these conditions. Three or four would easily enable me to start mass-production, particularly if there was any heating in the workshop. That’s enough to be going on as you probably already know the rest of the process. I’ll stop at this point and follow up when I’ve dyed, stitched and sealed it in a month or so.